Scot Eckley Landscaping Blog » Where Are The Plants? 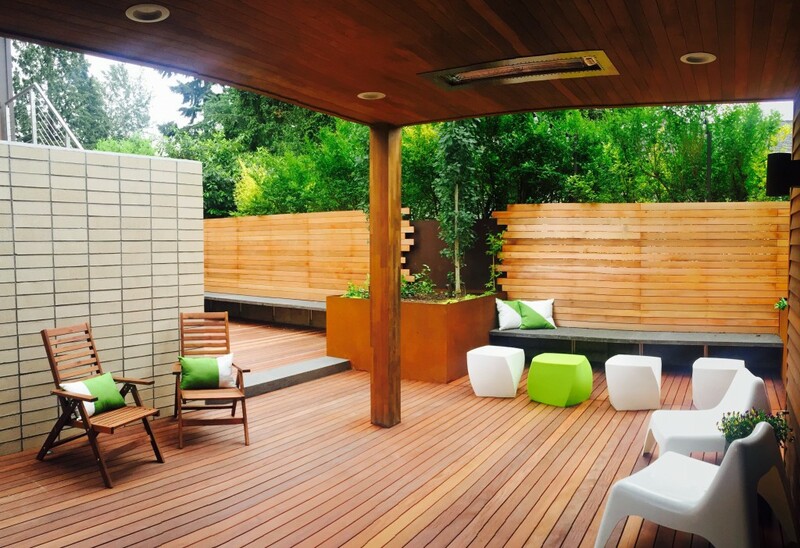 Here’s an outdoor living space we finished last year in Kirkland.Â I like how the mix of materials, colors and patterns make the space visually interesting and give it a lot of energy.Â The space looks great all year round and appears much bigger than it is.Â In fact, there are just a few plants – the columnar Aspen, evergreen Jasmine,Â and Creeping Jenny and Hops vine in the steel planter.Â The plants peaking over the top of the fence are borrowed landscape thanks to the neighbor’s privet hedge.Â One strategy we often use when designing small spaces is creating a stunning hardscape design that provide privacy and visual interest all year. Tags: Garden Elements, Garden Features, Inspiration, New Projects // Comments Off on Where Are The Plants?